If you’re starting a search for new window treatments, you’ve probably seen that many have a variety of benefits, from aesthetic appeal to energy efficiency. 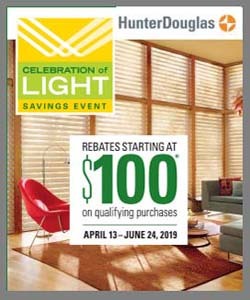 But did you know that Hunter Douglas offers an option that will let you get the benefits of two shades in one? At The Shutter Guy here in Charleston, we’ll be happy to show you the window fashions that can come with this option as well as discuss whether they’d be right for your needs. Contact one of our representatives today! Duolite from Hunter Douglas seamlessly lets you diffuse light when you want it and get room-darkening privacy when you need it. The Duolite Design system is available on Vignette® Modern Roman Shades, Silhouette® Window Shadings, and Duette® Honeycomb Shades. Duette Honeycomb Shades are time-tested window treatments that keep you warmer in the winter and cooler in the summer. They have a simple, sleek look that works well for all decor styles. Not only can you get the Duolite feature, you can also add top-down/bottom-up and LightLock™ options as well. The ultimate benefit, of course, is that they almost pay for themselves with the energy savings you’ll enjoy. The Vignette is a new twist on a time-tested classic! Make no mistake, this is not your grandmother’s Roman shade. With beautiful teardrop-shaped folds and no exposed rear cords, Vignette allows your windows to remain uncluttered and safer for children and pets. The dual-opacity option combines a light-filtering or sheer front shade with a room-darkening back panel that both roll on a single roller, providing day-night convenience at your fingertips. For more than 25 years Silhouette® window shadings has been the industry leader for high-fashion window treatments with superior functionality. These beauties come in a wide array of fabrics that provide view-through to the outside while protecting your flooring and furniture from harmful UV rays. Adding the Duolite feature integrates the room-darkening roller shade behind the shading. Position the roller shade at any height for increased privacy and light control. Contact us to schedule a consultation, and be sure to check out our Calling Out Cancer program to see how a percentage of your purchase with us goes toward cancer support and research.